We have several plants of this gorgeous species coming into flower in the greenhouse. 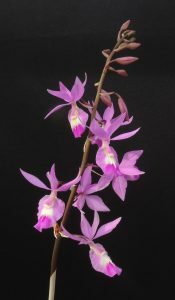 This Barkeria is found in from Mexico to Costa Rica in warm deciduous forest where it experiences a distinct dry season. It responds to the dry habitat by producing a mass of roots and growing tall canes rapidly during the summer growing season. The flowers are dramatic and long lasting. We find that Barkerias need to be mounted to do well as the roots rot in pots and we hang the bark mounts high in Warm Americas where plants get bright light and dry out rapidly after daily spraying. This plant has three flowering bulbs – one long one and two short ones which is a reminder that the species flowers when quite young from shorter bulbs but as it matures produces longer and longer bulbs with more and more flowers.